Last night I curled up under a blanket and finally gave in and vegged out literally, in front of the tv. The 2 programmes I chose to watch were the Great British Food Revival on BBC1 and Masterchef on BBC2. In the first part of the GBFR, Michel Roux Jr. was focusing on reviving fresh quality bread in the UK (a definite MUST in my book……. after years in Belgium and France, the UK bread industry is soggy in comparison, and in desperate need of more local bakers as opposed to supermarket blandness). But as I have perfect bread on tap from a number of wonderful local bakers in Brussels, the recipes were not going to inspire me to get into the kitchen to produce my own. The second part however was fascinating. The Hairy Bikers were reporting on how the humble cauliflower had lost it’s appeal in the UK over the last 20/30 years, to the extent that only 4 families in 10 serve it at home! How can anyone survive a year, let alone a winter, without a great cauliflower cheese! So today I’m joining the campaign to cook more Cauliflowers………. By the way, Masterchef was ok (posh meals in posh london restaurants), but looks much more exciting in next week’s programme when they are going to cook for a circus crew!! 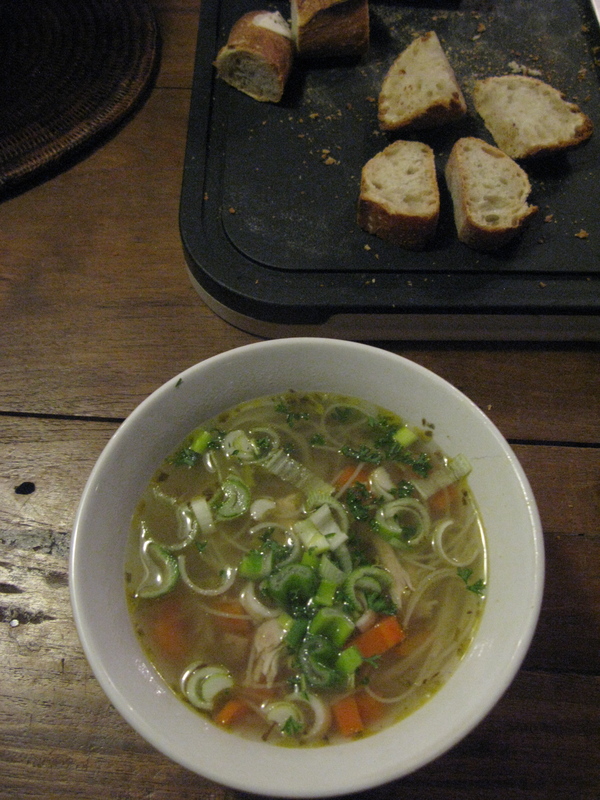 And just to report back on the chicken soup from Wednesdays (Day 67) blog. It out of this world awesome!! I had more at lunchtime today and plan another bowl tonight -> with a side dish of this simple cauliflower dish I found on the internet (to start my Cauliflower campaign!). Yummy! Preheat the oven to 220 degrees C. Grease a large casserole dish. Bake for 25 minutes, stirring halfway through. Top with Parmesan cheese and parsley, and grill for 3 to 5 minutes, until golden brown. 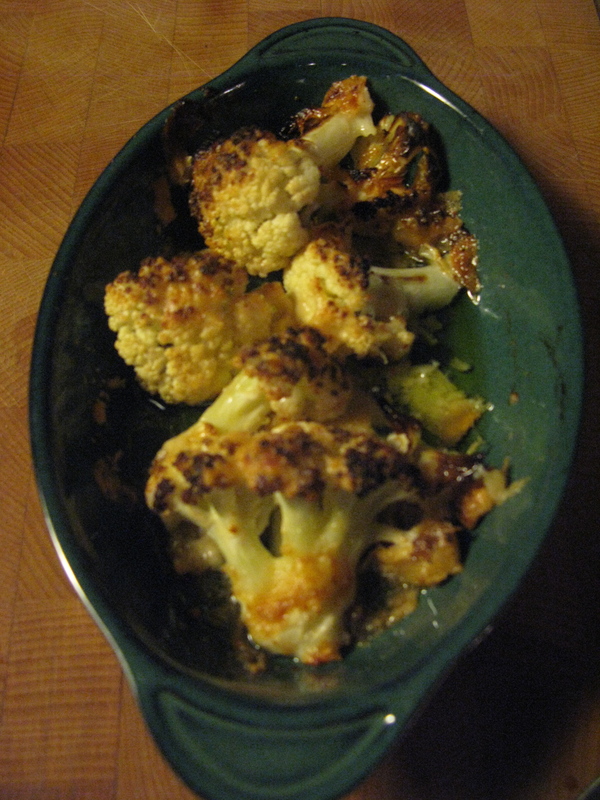 Simplicity itself from Roasted Garlic Cauliflower Recipe – Allrecipes.com. More tomorrow and over the weekend, as I dig further into the life and living of the humble Cauliflower. inspiration via BBC – Food – Recipes from Programmes : Great British Food Revival. You’re right about the smell, plus those childhood memories of it overcooked and soggy! I found roasting it last night solved both problems and was quite delicious. By the way, it must be great to have an outside kitchen! !